The Miami office is led by Carine Chehab, who is responsible for launching Human Rights Watch’s presence in Miami and growing its network in South Florida. The Miami Circle of Friends is comprised of active supporters of Human Rights Watch living in and around Miami. They represent Miami in the Human Rights Watch Council, an international network of opinion leaders who advance the efforts of the organization by raising awareness of local and global human rights issues as well as investing financial and/or intellectual capital in our work. Save the date for our Voices for Justice Annual Dinner on Thursday, March 14, 2019 at New World Center. Human Rights Watch Miami hosted its third Voices for Justice Annual Dinner at the New World Symphony two weeks ago. Each year the Voices for Justice Annual Dinners celebrate human rights defenders from around the world who put their lives at risk to protect the rights and dignity of others. 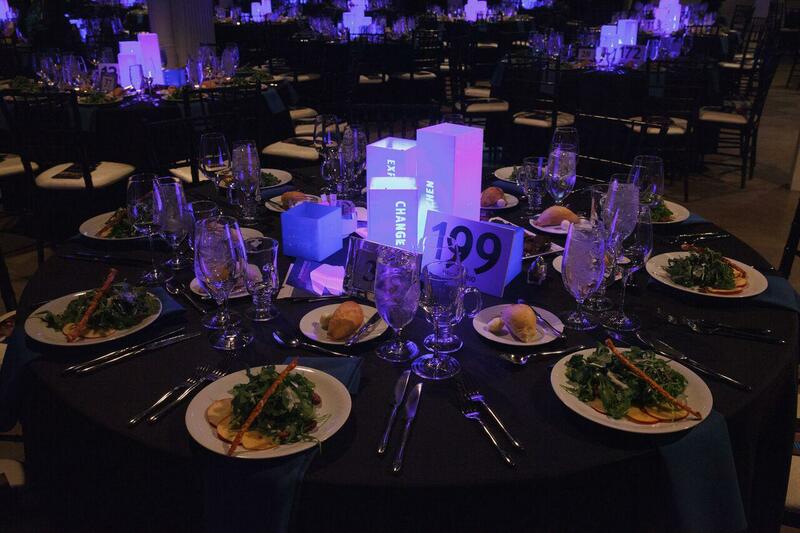 The dinners gather over 6,800 supporters in more than 20 cities worldwide. In Miami, this year’s dinner was our most successful yet—raising just over half a million dollars for Human Rights Watch. The dinner program consisted of four speakers all known for their commitment to defending human rights in times of crisis. This year’s Defenders of the Truth, Managing Director Nic Dawes, Senior Iraq Researcher Belkis Wille, Emergencies Researcher Johnathan Pedneault, and Brazil Director Maria Laura Canineu, shared their stories about making meaningful change in some of the world’s most challenging environments. Inspirational musical performances by the New World Symphony Fellows and Guitar over Guns musicians were provided throughout the dinner. We are deeply grateful for our donors’ invaluable support, whose generosity will enable our researchers and advocates to continue their meticulous investigations and to expose the world’s most pressing human rights violations. A special thank you to our Dinner Co-Chairs, Joy Fishman, William Kleh, and Shelley Frost Rubin who helped make this evening such a success. Human Rights Watch Board Member Paul Gray and Dedrea Gray of the Richard Gray Gallery, in collaboration with the Miami Circle of Friends generously hosted a reception discussing the connection between arts, free expression and human rights. For Human Rights Watch Deputy Program Director Tom Porteous, this topic has resonance. Tom eloquently described how viewing a Francisco Goya painting of the Spanish Civil War that portrayed war as a devastating crisis rather than a heroic endeavor, led him on a path of journalism, diplomacy and advocacy. For over 40 years, Human Rights Watch has been a fierce defender of civil society and the most vulnerable people worldwide, including journalists, authors and artists. This reception, hosted during Art Basel Miami, brought together the global arts community who share these values and have a critical role to play in facing these challenges. WHERE: Freedom Tower, 600 Biscayne Blvd. Miami Dade College (MDC) illuminated its historic Freedom Tower bright blue at sunset, Monday, Dec. 10, in support of Human Rights Day 2018. This year, which marks the 70th anniversary of the Universal Declaration of Human Rights, MDC joined other iconic buildings around the world in a display of support for human rights under the guidance of MDC President Dr. Eduardo J. Padrón. Dr. Padrón, a Cuban immigrant, was awarded the Presidential Medal of Freedom by President Barack Obama in 2016 and is a member of the Miami Circle of Friends of Human Rights Watch. Human Rights Day celebrates the adoption in 1948 of the Universal Declaration of Human Rights by the United Nations General Assembly. The Universal Declaration delineated, for the first time, fundamental human rights to be universally protected. The declaration has since been translated into over 500 languages. This year, in partnership with Human Rights Watch, over 25 landmarks shone blue in solidarity with the human rights movement and the values we work to defend. Human Rights Watch Health and Human Rights Researcher Megan McLemore presented her latest report “Living at Risk” at a press conference sponsored and hosted by The Betsy Hotel in South Beach. This report, that reveals systematic failures to provide HIV care to the trans community, was launched on Trans Day of Remembrance to highlight the severity of this ongoing crisis. Florida has the third-highest HIV rate in the United States, led by Miami-Dade and Broward Counties. HIV among transgender women is at crisis levels, but the state is failing to provide basic services to many trans women in south Florida, endangering their lives and the health of the community. Florida and federal HIV officials talk a lot about the importance of reaching “high risk” groups like transgender women. Human Rights Watch spent more than a year investigating whether the reality on the ground is matching the rhetoric – it isn’t. Just before the launch of the report, Florida Department of Health reviewed the findings and approved its accuracy, expressing support for working with us to implement some of the recommendations. We are excited for Megan to carry on this meaningful work in the new year and advocate for access to health care without discrimination for those facing the greatest barriers to care. Rosa and Carlos de la Cruz hosted a private cocktail reception and briefing with Human Rights Watch’s Americas Executive Director Jose Miguel Vivanco and our lead researcher for Venezuela Tamara Taraciuk Broner to discuss the state of human rights in Latin America, including recent events in Nicaragua, the health crisis of Venezuelan refugees, and the recent election in Brazil. This is a particularly challenging time for human rights in the Americas region. The current exodus of Venezuelans has generated the largest migration crisis of its kind in recent Latin American history. As of September 2018, the United Nations has estimated more than 2.3 million Venezuelans have left their country since 2014. Meanwhile, Nicaragua is experiencing a brutal repression and a crackdown on protestors, and new governments are taking office in countries like Mexico, Colombia and Brazil. In light of these events, José Miguel Vivanco and Tamara Taraciuk shared exclusive findings and video footage from their investigative work throughout the region, as well as the successes and challenges they have faced when advocating with global leaders to end the ongoing crises. Tamara also shared an exclusive first-look at her new web feature, “The Exiles,” highlighting how Venezuela’s devastating humanitarian crisis is unfolding at its borders. In 1999, Colorado mother Jessica Gonzales experiences every parent’s worst nightmare when her three young daughters were killed after being abducted by their father in violation of a domestic violence restraining order. Human Rights Watch partnered with Miami Law Human Rights Clinic, The Women’s Fund Miami-Dade, University of Miami School of Communication, and the University of Miami College of Arts and Sciences to host this screening of the powerful documentary film Home Truth, which chronicles Jessica’s groundbreaking quest for justice that reached the U.S. Supreme Court and the Inter-American Commission on Human Rights. After the screening, Human Rights Watch Women’s Rights Senior Researcher Amanda Klasing participated in a discussion and Q&A with the survivor-activist herself Jessica Lenahan, as well as Miami Commissioner Daniella Levine-Cava, the filmmakers, and human rights expert Caroline Bettinger-Lopez of the Miami Law Human Rights Clinic. Shot over the course of nine years, Home Truth sheds light on how our justice system responds to domestic violence and how the trauma from domestic violence can linger through generations. Over a hundred participants joined us in considering why freedom from domestic violence is a fundamental human right. Americas Society/Council of the Americas generously hosted Human Rights Watch’s latest report about the current human rights crisis in Venezuela and the resulting Venezuelan exodus. Human Rights Watch Americas Executive Director Jose Miguel Vivanco and Americas Senior Researcher Tamara Taraciuk Broner discussed the report’s findings at a private breakfast briefing for AS/COA members before the press conference. With more than 2.3 million Venezuelans leaving the country since 2014, the report examines how the region’s receiving countries have responded to this unprecedented migration crisis. You can find the report here, which includes recommendations for a concerted, common approach by Latin American countries to deal with the exodus. The impact of felony disenfranchisement laws was exacerbated during the 20th century’s mass incarceration phenomenon as more people were convicted of felonies, more people were sent to prison, and prison sentences have grown longer and increasingly disproportionate. For example, people in Florida can now lose their voting rights for one single drug conviction. In a 2016 investigative reportreleased by Human Rights Watch and the American Civil Liberties Union, the groups found that every 25 seconds in the United States someone is arrested for the simple act of possessing drugs for their personal use. That is 1.25 million arrests per year. Around the country, police make more arrests for drug possession than for any other crime, including violent crimes. As the report reveals, those impacted are disproportionately from communities of color and the poor. (Miami) – Latin Americans and their governments should speak out and urge President Nicolás Maduro’s government to recognize and tackle the devastating human rights and humanitarian crisis in Venezuela, Latin music star Ricardo Montaner and Human Rights Watch said in a campaign launched today. Montaner, the iconic Argentinian singer-songwriter who grew up in Venezuela, joined forces with Human Rights Watch to launch #TodosConVenezuela (Everyone With Venezuela). The campaign, which urges ordinary citizens, especially in Latin America, to speak up for their neighbors, starts on April 9, 2018, ahead of the regional Summit of the Americas. Through the campaign portal people are asked to tweet at several Latin American presidents, asking them to confront Maduro and join other governments in speaking out about his abuses. The situation in Venezuela will be on the agenda at the Summit of the Americas in Lima, where leaders of the region’s governments will meet on April 13 and 14. #TodosConVenezuela launches on April 9, 10 days before the first anniversary of a massive anti-government protest in 2017 that was met with a brutal police crackdown. In Venezuela, government critics and opponents are arbitrarily detained and prosecuted, and in some cases tortured. Security forces and armed pro-government groups have killed and injured demonstrators and bystanders. The rates of infant and maternal mortality have skyrocketed, people are going hungry, and sick Venezuelans lack access to the most basic medicines. The Venezuelan government is responsible for the repression and crackdown on dissent, and for denying the existence of a humanitarian crisis that it has failed to tackle, Human Rights Watch said.